As you know, we have been part of The Bag Up Manitoba program once again. The total number of bags we collected was 56, 166 bags. Awesome job OBE! We brought in a lot more than last year. Last year we collected 32, 203 bags so this year we collected 23, 963 more bags than last year. In first place, was Mrs. Enns/ Mrs. Palaschuk class with 12, 699 bags and they won a pizza party. In second place, was Mrs. Fehr/Mr. Gillingham class with 4,121 bags and they won an extra gym class. 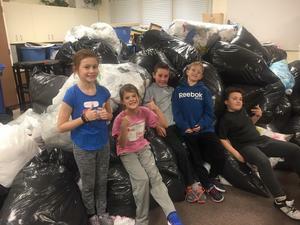 In third place, was Mrs. Brooks class with 3,904 bags and they also won a free gym class. The bags that you brought in turn into things like frisbees, benches, garden boxes and birdhouses. Thanks for bringing in so many bags this year and helping to keep our planet earth safe.